Pure substances that form glasses are quite common, but up to now the formation of a bulk glass formed through vitrification of a pure monatomic elemental liquid has been elusive. When crystal nucleation times are long compared to the time for assembly of amorphous forms, then the glassy state can be observed. A key requirement is the lowering of the freezing point of the liquid sufficiently so as to increase the competition between crystals and a stabilized liquid. Recently a group from Arizona State University, led by M. H. Bhat and including CDAC Academic Partner Jeff Yarger, has used pressure to stabilize the metallic liquid state of elemental germanium, subsequently temperature quenching the liquid to create for the first time a bulk metallic glass of a monoatomic element. In the process, the group has also observed an unusual transition from this high density amorphous, metallic (HDA) phase to a low density amorphous, non-metallic (LDA) phase. A report of this work appeared recently in the August 16 issue of Nature [Bhat, et al., Nature, 448, 787-791 (2007)]. Single crystals of elemental Ge, approximately 20 microns in diameter were loaded into a diamond anvil cell. Melting of the Ge was then achieved by pulsed laser heating of the Ge crystals held at 5-11 GPa. The material was then quenched from high temperature. Above 7.9 GPa, the Raman band characteristic of crystalline Ge is replaced by a broadened fluorescence signal, indicating the amorphization of the quenched liquid. Samples were then removed from the pressure cell for electron and optical microscopy analysis. Figure 1a shows electron micrograph of the quenched sample. Globules of the quenched material are partially amorphous and partly crystalline, as illustrated by the electron diffraction patterns taken from two separate parts of the same globule (Fig. 1c, d). The boundary between crystalline and glassy domains is clearly seen in the micrograph in Fig. 1d. Structure factors derived from the electron diffraction patterns confirm that the quenched sample is essentially identical to amorphous, non-metallic Ge derived from vapor deposition, but very different from liquid Ge (Fig. 2a). 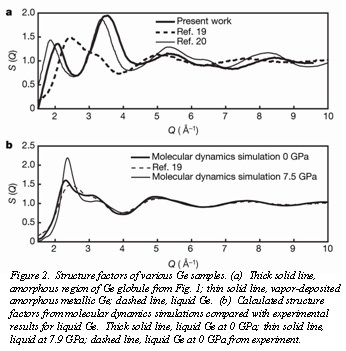 Molecular dynamics simulations (Fig. 2b) of liquid Ge at ambient conditions give excellent agreement with experiment, but the simulation of liquid Ge at 7.9 GPa shows significant differences from the quenched samples in Fig. 2a. This result indicates that (1) the amorphous solid formed on temperature quench of the metallic liquid at 7.9 GPa (metallic HDA) is quite different than the phase present after the release of pressure (LDA), and that the pressure quench from 7.9 GPa to ambient conditions has resulted in an unusual HDA-LDA transition. 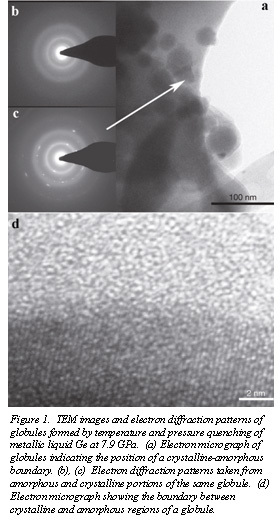 In related work carried out at HPCAT, Q. Zeng and co-workers, have uncovered an unusual amorphous-to-amorphous phase transition in the bulk metallic glass with composition La32Ce32Al16Ni5Cu15. 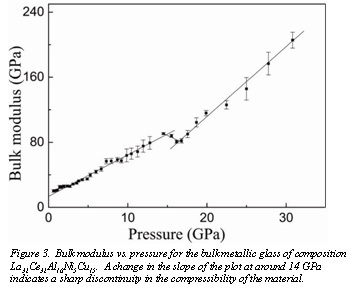 A change in the compressibility of the glass at around 14 GPa is inferred from the sharp discontinuity in the plot of bulk modulus versus pressure (Fig 3). Such a change in the compressibility suggests a second-order transition among amorphous phases driven by an electronic coupling of the 4f electrons to those in the conduction band. The temperature dependence of the electronic and magnetic properties show that the resistivity of the glass does not depend on the applied magnetic field, indicating that this transition in La32Ce32Al16Ni5Cu15 is driven by a coupling of the 4f electrons in Ce with electrons in the conduction band of the parent alloy. These results were published in the August 21st issue of Proceedings of the National Academy of Sciences [Zeng et al., Proc. Nat. Acad. Sci., 104, 13565 (2007)]. The same issue of PNAS featured another paper describing work involving CDAC, a study of the pressure-induced transition in SiO2[Lakshtansov et al., Proc. Nat. Acad. Sci., 104 13588 (2007)].